Soften the marzipan in the microwave for a few seconds, then beat marzipan, sugar and soften butter together until you create a smooth paste. Add the eggs and continue whisking. Fold or whisk in the almonds, almond extract, flour and baking powder, until mixed well together. Spoon the mixture into the 12 cupcake cases and bake in oven for approximately 20 minutes, or until baked. Cool down on wire rack, and then ready to ice. In terms of icing, sieve the icing sugar into a bowl and stir until thick runny consistency. Spoon over the cupcakes and allow to run down the sides. Then let it set. To decorate: what I’ve done is take some additional marzipan, and coloured it with food coloring. I’ve then make tiny balls which I’ve squished down flat and rolled, then cut in 1/2. They now look like baby roses. Next I coloured some marzipan green, flattened and cut out leaf shapes. 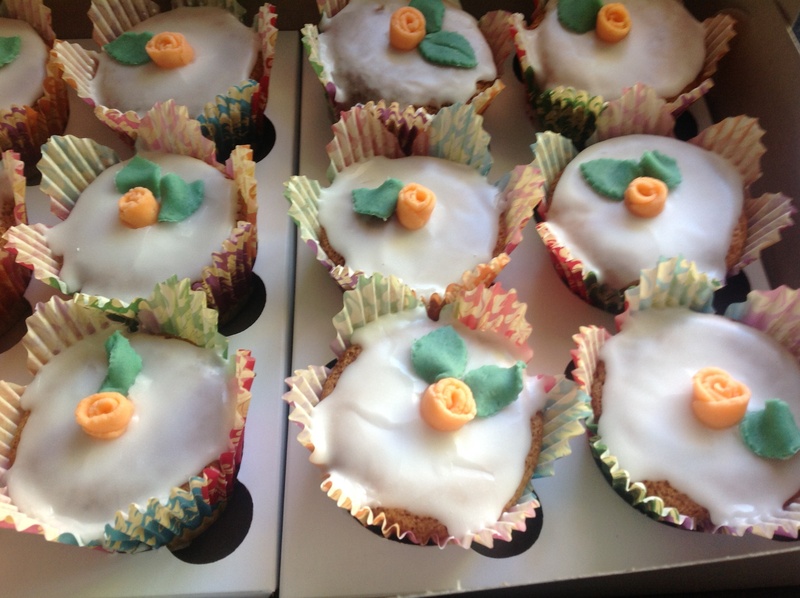 And there you have it, a mini rose with leaf on each cupcake, perfectly edible and providing the final finish. Easy as 1, 2, 3! Tips: cupcakes are ready, when you press them lightly and they spring back on touch. Icing chosen is lighter than a butter icing due to the richness of the cupcakes and not to detract from the taste profile, which butter icing a could overpower and make it too much! This entry was posted in Baking as easy as 1..2..3 and tagged almond extract, cupcakes, ground almonds, marzipan by angelb38. Bookmark the permalink.